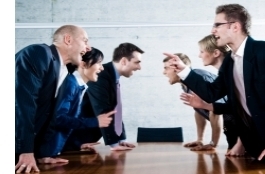 As you return from lunch, there is an angry mob waiting for you in your office. It’s three of your top salespeople and the Vice President of Operations. None of them look happy. The salespeople have just been “dressed down” by the Vice President of Operations regarding how client expectations are set during the sales process. And, they’ve all come to you, the Vice President of Sales, for intervention. The Operations team uses a tightly-defined process for implementing and supporting clients. They have structured the process such that they can consistently deliver a high service level for clients. Operations has documented work instructions and developed metrics for each step of the support process… and is proud of their well-oiled machine. However, the sales team feels that the operations process, while it may work fine internally, is not what the majority of the clients’ desire. So, they’ve been setting different expectations with clients than what actually occurs to win the accounts. When a new account is sold and passed along to Operations to implement, the Operations team regularly hears, “That’s not what my salesperson told me…” Thus, the client is immediately uncomfortable and the Operations team is stuck in the middle. The Operations team feels their process is best for the clients. The Sales team feels that the process is disconnected from the needs of the clients. What is your approach to work through this issue? Can both sides be happy with the resolution?